Fierce rivals Seattle Sounders and Portland Timbers met in the fourth round of the U.S. Open Cup and the resulting match surpassed anything anyone could have dreamed up. Down 1–0, Seattle were reduced to 10 men after Brad Evans was sent off in the 69th minute for a second booking, but Obafemi Martins scored an equalizer in the 79th minute, forcing the game into extra time. And it was in extra time that all hell broke loose. Seattle began extra time with just nine men, since Martins picked up an injury after they already used all three of their substitutions. Rodney Wallace took advantage of this and gave Portland a 2–1 lead in the 100th minute. Then in the 113th minute, Seattle’s Michael Azira was shown a straight red for an apparent elbow, reducing the Sounders to eight men. This enraged Clint Dempsey, who took what appeared to be either the referee’s book or a card off the official as he spoke to another Sounders player. Dempsey tossed the item on the ground, then grabbed it back and ripped it up. The ref showed the U.S. national team captain a yellow for this unusual act, then a red as Dempsey walked away. Dempsey had to be dragged away by his teammates. He then sarcastically applaud in a linesman’s face on his way off. If he wasn’t a local hero before, he definitely is now. 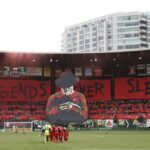 So that put Seattle down to just six outfield players and with that drastic of an advantage, Portland couldn’t help but score one more time in the 116th minute to win 3–1. The atmosphere turned sour, with irate Sounders fans throwing things (including a trash can) towards the pitch, that the match officials had to be escorted away by police once the match finally ended — an unusual occurrence for a game involving MLS teams, let alone a fourth round tie in the largely ignored U.S. Open Cup. If this was some kind of performance art to get more people to watch the U.S. Open Cup, it just might work.